Previous post was about the many thoughts that have accumulated after walking trough history and the Bible by the seams, and what is left with the question after all the doomsday prophecy that swirl around and has never been fulfilled. The churches that can be strong in these prophecies is often the churches that have the strongest ties and interest of being Israel supporters, but I do not go into it now. I have also said I’ll write about the Book of Revelation, which I both dread and look forward to. Ironically enough, the most difficult book of the Bible is called “Revelation”. It can be difficult to understand the Book of Revelation, but if you enter the book with the right mind without already embedded obstacles and sharp curves that old learning tends to do, things can get a bit simpler. Normally, one starts at the beginning of a book, and it’s where John also comes with its explanation of how to understand his book, for example, expectation of when the prophecy will happen, who the letter is addressed to, and his explanation of the method to understand his letter. The first thing John does is to set the vision he received from Jesus in the right time, not because himself has decided the time but that Jesus had told him so. In much the same way Jesus explains to the Pharisees and His disciples what time the temple destruction would happen (Matt. 23:36, 24:34), John makes the same. He writes to the seven churches in Asia and emphasizes “the things which must happen soon” (Rev. 1:1) and that “for the time is at hand.” (Rev.1: 3). What we see is different from Jesus’ explanation is that John describes the time is closer than what Jesus did to His disiples. Jesus explains that the events will occur in the generation that disciples were in, while John explains that the time is near and will happen soon. John was one of the disciples in the generation, but now it have been a 40 years period and the time is even closer. The same words “near” can be found again in Jesus explanation of the sign “that the summer is near” (Matt. 24:32), when His “time is at hand” (Matt. 26:18) and “The Passover of the Jews was at hand” (Jn. 2:13). You can also see that John stresses the importance of time by repeating what he is saying in verse 1 in verse 3, but in a different way of expression … for those who would not get it back in verse 1. In conclusion, we again find the exact same stress points (Rev 22:6, 22:10). Let’s compare them. John wrote probably the introduction of Revelation after the vision and thereby promotes the importance of the timeframe of his audience in the opening of the book, so that the reader will enter the book with this information and also end the book with the same information. Revelation. 22:10 also shows us that this is a time that will happen very soon, because John was told not to put the seal on the prophetic words of motsetting to Daniel, who would set sail on the book. Daniel lived several hundred years before John and the angel told Daniel put the seal on the book, but much later in the story, ask a similar, or the same angel John to not put the seal on the book, because the time is near. Daniels expectation was of a long-term perspective; John expectation was of a short time frame. 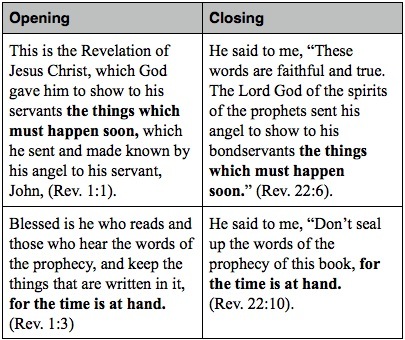 This can not really been clearer … It shows us that John is not writing to a congregation of 2000 + years into the future. It would be quite mercilessly and sarcastically made by him, against a church in the first century who suffered painful persecution and was told that the divine judgment of the wicked was near and would soon come. So to whom do he writes? He writes to a specific group of people, to the seven churches of Asia that he served in. Something interesting to see is that the seven cities that the seven churches were in, rattled off in the same order as the Roman mail route went. These cities were old historic towns that John addressed in chapter 2 and 3, and in these letters he rattles off several historical, geographical, political, cultural and religious allusions that fits perfectly with what we know about these regions today. The letter was written to churches that went through great trials and sufferings, which is evident already in the first chapter. Suffering, persecution and martyrdom theme is something that recurs throughout the book of Revelation (Rev. 2:9-10; 3:9-10, 6:9-11, 11:7.8, 11:3, 18; 12:10; 13:10; 14:11-13, 16:5-6, 17:6, 18:20, 24, 19:2, 20:4, 6). Martyrs are those who receive God’s special blessing, because they were slaughtered for their faith (Rev. 6:9-11). This is the real first-century Christians, something we must bear in mind further in Revelation. How John explains how his letter to be understood, we can see already in Revelation 1:1. As I have emphasized, “God gave Him to show His servants”, shows that the revelation is given “to show” the message, which was signified by the angel. The fact that John sees these things can not be taken literally but more figurative. “the mystery of the seven stars which you saw in my right hand, and the seven golden lampstands. The seven stars are the angels of the seven assemblies. The ten horns that you saw are ten kings who have received no kingdom as yet, but they receive authority as kings, with the beast, for one hour.” (Rev. 17:12). He said to me, «The waters which you saw, where the prostitute sits, are peoples, multitudes, nations, and languages.» (Rev. 17:15). We need to avoid too much literal interpretation of Revelation. The main thing I want to promote when it comes to enter the revelation, is to understand the history and the time that is talking about in the revelation, the time when Christ comes with the judgment of those who rejected him, on those who killed the prophets He sent, and for the persecution of His saints in the time between Christ’s crucifixion and the judgment in 70 AD. More explanation of some of the passages are coming during my next entries.